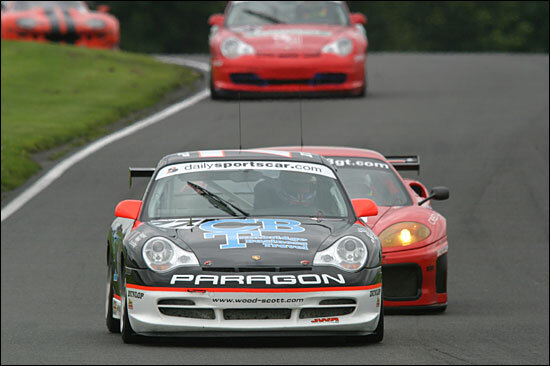 It was a pumped-up Stuart Scott and Steve Wood who arrived at the fast and challenging Oulton Park circuit for rounds 9 and 10 of the 2004 British GT Championship. “We’ve been out testing and have found some speed and confidence in the car,” said Steve on Saturday morning. The free practice session, on a very greasy circuit, gave proof positive that the car was working well: fourth in the dailysportscar.com cup class marked significant progress for the team. The quick fire qualifying sessions on Saturday afternoon can prove to be something of a lottery however and the combination of a wet track, traffic and a session interrupted at a crucial time by a red flag for the recovery of a ‘nerfed’ N-GT car conspired against Stuart in the first session, the car finishing up toward the wrong end of the timing screens. One plus though was that the #77 car was entirely undamaged, a growing number of the contenders in both classes having added significantly to the season’s parts bills (and their pit crews workload) - while at JWR the crew was able to wipe the windscreen and send the Porsche on its way. Race 1 would see Stuart start and within just a few hundred metres he would have good reason to be thankful that his qualifying position was towards the back of the pack. The season’s biggest pile-up so far had been triggered at the front of the race by a gaggle of squabbling N-GT cars, four cars were out on the spot, including the other JWR-run Cup car, Pete Chambers riding over the front of the Xero Corvette. When the dust had settled it left Stuart running in a very strong 14th place overall (from 23rd on the grid! 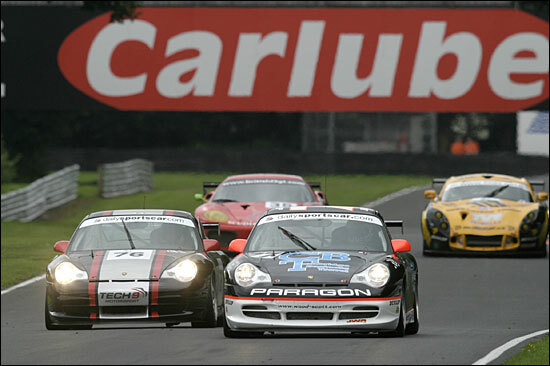 ), pushing the Morgan ahead very hard indeed, looking up the inside into Old Hall corner and clearly enjoying his race. 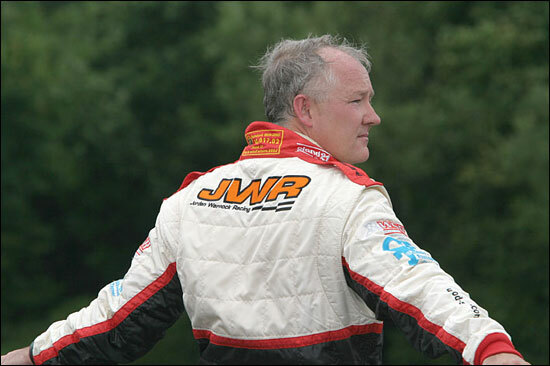 The pit stop window was now looming, Steve Wood ready and waiting to take over the reins. Steve was immediately into his rhythm and by the 40 minute mark had lifted the car up to 12th place, the Morgan now far behind and Adam Sharpe’s Tech 9 Porsche also giving best (for now) to the CBT / ART-backed 911 GT3. The tussle between this pair made for fantastic viewing for lap after lap, the Tech 9 car seeming to have the edge on pace but Steve resisting every move with vigour: firm but fair was the operative phrase, with a degree of wheel-banging too, the Tech 9 car making contact on both sides with #77 and leaving Steve with a very odd-handling 911. But it would be a sad end to the race for the Tech 9 car, a heavy accident in the closing stages leaving the Porsche only able to crab around to a hobbled finish. For Wood and Scott the news was rather better. 12th overall and fifth in class, a fine reward for the efforts of both Stuart and Steve. Sunday’s race would see an altogether less eventful affair, but not without a fine display of close racing. The #77 car was right in the thick of things in the Cup class battle, Steve starting the race and holding onto third in class, right behind his Saturday tormentor (and eventual Sunday race winner), Adam Sharpe in the Tech 9 Porsche. 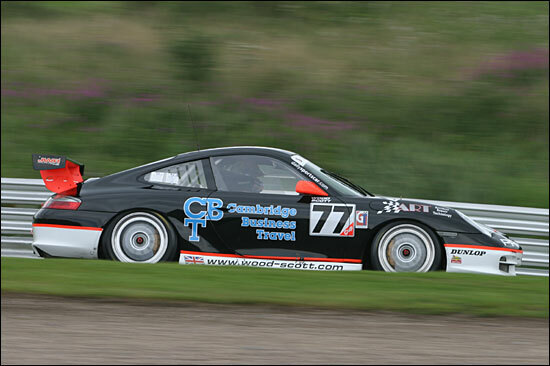 He was also fending off the attentions of Michael Caine in the Pete Chambers JWR car, the trio of Porsches all trying to reel in Allan Simonsen in the Glenvarigill Ferrari. 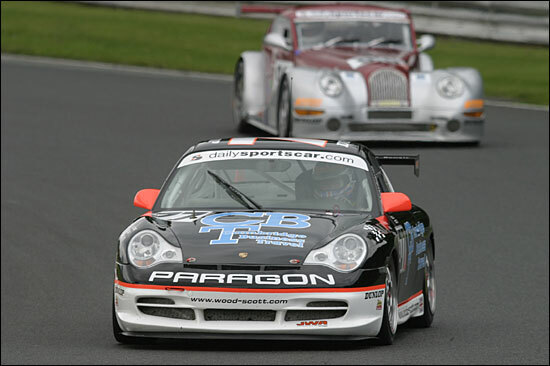 Steve held his own through to the pit stop and then it was Stuart’s turn, rejoining in amongst a gaggle of quick runners in the class including the ABG Motorsport Porsche, Ni Amorim’s title challenging Ferrari 360 and Gavan Kershaw’s super-quick Lotus. Stuart battled away but kept the #77 car very much on the black stuff, and a strong and steady run left him ceding a couple of positions to some of the quicker class runners but grabbing a valuable spot back from the Keith Ahlers’ Morgan Aero 8. Sevent in class seemed a small reward for the efforts of both drivers but the boys were happy with the weekend: “The car was great and when we had space to race we were right on the pace. The standard out there is good and getting better and that’s a good thing for us, it drives us to do better,” summed up Steve. The #77 car is finding pace at every race : next time out is the famous Silverstone Grand Prix circuit, the scene of past F1 glories (and present F1 parades!). 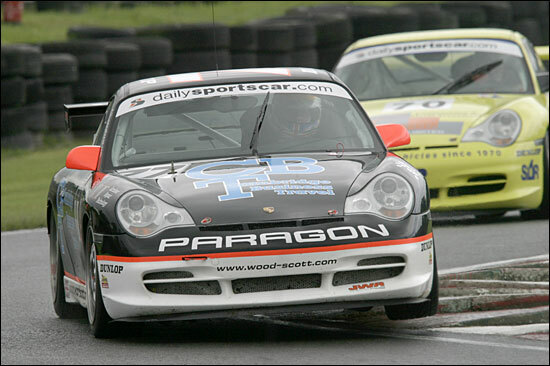 The sweeping curves and long straights should suit the 911 brigade. Time for another step-up the order then for Wood Scott Racing.